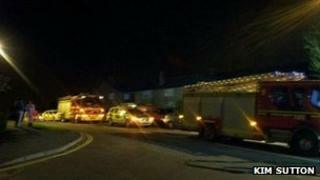 A man has died in a fire at a block of flats on an estate in Southampton. The blaze broke out in the first floor flat at Dyneley Green in Townhill Park, at about 19:40 BST on Thursday. The man, aged 69, was found dead in an armchair in the lounge of the flat by firefighters. No-one else was injured during the fire. An investigation into the blaze, which is not being treated as suspicious, is being carried out by police and the fire service.